Our Preschool Program empowers children to learn! The Stepping Stones Child Care Preschool Program was created and developed for children 30 months to Kindergarten age. 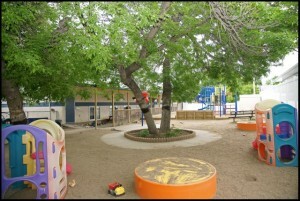 The park like play area’s make Stepping Stones Child Care a great place for kids! Our Preschool Program is available at all 3 locations. We are open Monday to Friday 6:30 am to 6:00 pm at our Robinson Street Location, and 7:00 am to 6:00 pm at our Broad Street location. We know many parents need child care during hours other than 9-5! We offer extended day care hours at the Stepping Stones Child Care Elphinstone Street location, 5:30 am to Midnight Monday to Sunday/ 7 days a week. At Stepping Stones Child Care Co-operative, we believe a low staff to student ratio helps children learn more, by having more individualized and focused time with each child. We have a ratio of one staff for every 10 children in our Preschool Program. Children in our preschool groups are encouraged to participate in cooperative play. This helps them learn in many areas—physical coordination, emotional development, and those tricky sharing skills! 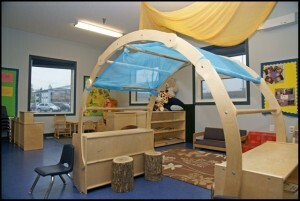 Let your preschool child grow, learn, and explore at Stepping Stones Child Care Co-operative! Stepping Stones Child Care staff works with children in our Preschool Program to help them develop problem solving skills. Our staff also encourages age appropriate self help skills. Both of these skills are empowering for the child to learn (especially before kindergarten) and will help them throughout their lives. The Stepping Stones Child Care preschool rooms are very busy with children exploring a wide variety of activities that include science, art, dramatic play, music, water/sand play, community outings….and getting ready for kindergarten!